Why do we need DSE Workstation assessments? The Display screen equipment (DSE) regulations require DSE assessments to be conducted for all significant users of display screen equipment (computer workstations). This would cover almost all office employees in the current day and age. The regulations are in place to reduce the risk of musculoskeletal disorders (e.g. back pain, neck pain, shoulder pain, carpel tunnel syndrome, sciatica etc. ), eyestrain, headaches, stress and fatigue. The DSE regulations can be found here . This assessment can be called a Display Screen Equipment assessment (DSE Assessment), a Visual display Unit assessment (VDU assessment) or a workstation assessment. A site visit is conducted where the workstation(s) are assessed by our chartered ergonomists ensuring compliance with Display Screen Equipment (DSE) regulations and can be conducted on individuals or departments/sites. The user is assessed at their workstation and a report with findings and recommendations is provided. Cost and time effective, ideal for large groups on a preventative basis, this on-site DSE assessment is conducted with the user at their workstation. 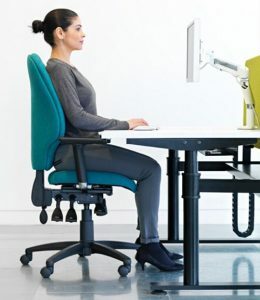 The assessments are conducted by a chartered ergonomist who also provides training in optimum set up and posture to each user. This ensures compliance with the DSE regulations. Any recommendations that need to be implemented will be outlined in a short summary report per user including guidance on any equipment that may be required. Up to 12 compliance DSE assessments can be conducted in one session per site. Recommended for early intervention and more complex cases (e.g. return to work, serious illness or injury). Individual users will be interviewed by our chartered ergonomist on-site prior to the DSE assessment taking place. This will provide detailed information on any aches/pain or discomfort felt by the user from any aspect of their workplace covering both physical and psychological issues. The DSE assessment will then be conducted with the user at their workstation. Photographs and measurements of the workstation will be taken where necessary. Findings from the interview and workstation assessment will be outlined in a detailed report with information about suitable equipment where required. Up to 4 comprehensive DSE assessments can be conduct per site per session.